Some lifting tasks call for wire rope that is not going to rust. Stainless steel rope is the perfect choice, with this 44mm 6×36 stainless steel wire rope taking heavy duty load handling to the next level. Fibre or steel wire core; which is right for you? 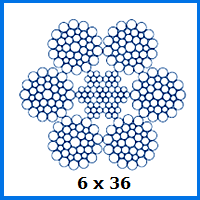 This is the question you need to answer, as this rope, along with its stable mates in the 6×36 range, is available with one or the other at its centre. With a fibre core, the 44mm rope has a working load limit of 102,247kg and a breaking force of 1,003kN. With an independent steel wire core, these limits rise to 110,303kg and 1082kN respectively. The weight of the rope will rise, while its flexibility falls, so balance the benefits to determine the right choice. Load capacity is not necessarily at the forefront of your mind when ordering stainless steel wire rope. Relative strength could be more relevant, for example, in which case our 8×25 compacted rope will suit. Our 1×19 rope is also very strong and versatile, sharing anti-corrosion properties with its counterparts in the range. For marine lifting applications, we can even supply bespoke crane rope, whether in the form of ship crane rope, dockside crane rope or many more excellent choices. Whether you choose to email RSD or give us a call on 01384 78004, our team will be ready and willing to aid you in whatever way possible, getting you the wire rope you need affordably and efficiently. 44mm 6x36 Stainless Steel Wire Rope Overall rating: 5 out of 5 based on 6 reviews.